Version 2.1.0 of Shredder8, the most popular Windows-8 file shredder app, has just been published. The new version has an optimized shredding and wiping functionality, which is up to 300% faster than in previous versions. The calculation of the average speed and remaining time has also been modified, to be much more accurate. Version 1.3.0 of the popular XXL Currency Calculator is now available in the Windows Store. The update introduces a settable precision from 0 to 6 digits, also new rates are only loaded if there is an internet connection. The online/offline status is shown in the application toolbar. The successful Windows-8 App Shredder8 is now also available for Android devices through Google Play. Deleting a file or directory does not remove the contents. Recovery tools can be used to restore the previous content. 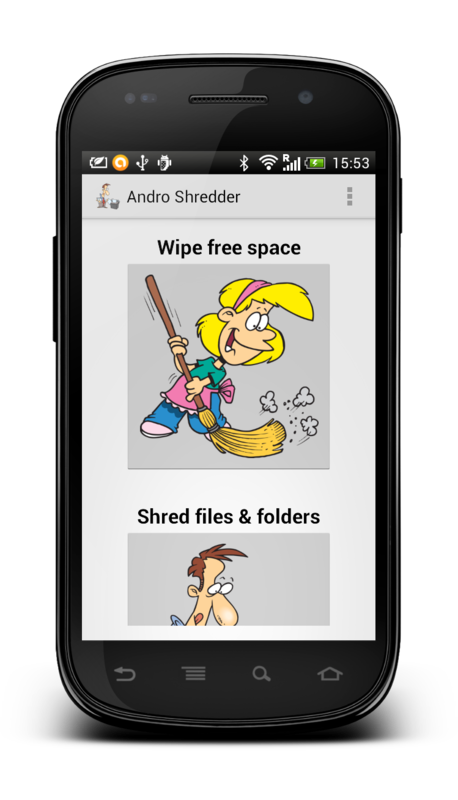 AndroShredder allows you to destroy the file contents prior to deleting files and directories. where old file content may still exist. which should be enough for most SSD based storage devices and USB flash drives. Update 1.2.1 of the XXL Currency Converter is available at the Microsoft store. It fixes an occasional bug in the copy&paste function and in downloading new rates. Version 2.0.1 of Shredder8 has just been published. It fixes a minor bug in the display of the storage space and some typos in the German localization. 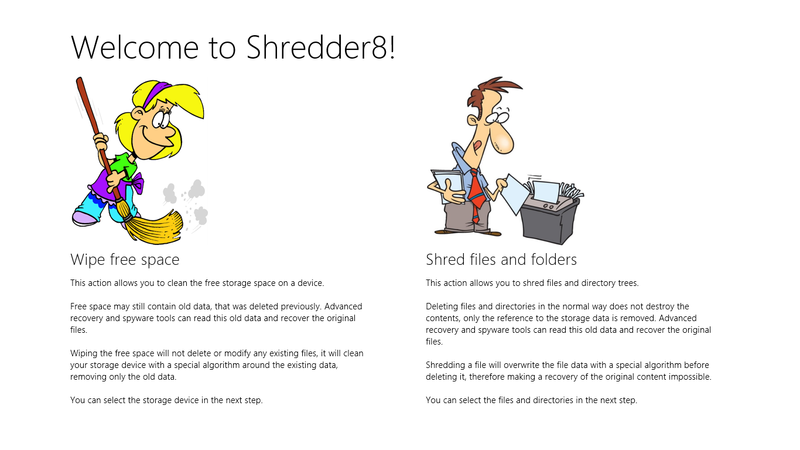 Version 2.0 of my very popular Shredder8 Windows 8 App has been published by Microsoft. First feedback from users is great! Thank you very much for that! It is a complete rewrite from scratch, based on the experiences with version 1.0. The online documentation can be found here, at the Shredder8 page. Thanks again for all the feedback and sorry that it took a bit longer than expected. I have been asked for updates on the Shredder8 application, as the current version has its problems with the latest Windows 8 updates, especially with Windows 8.1. A complete rewrite of the application is currently in the works, with about 80% of it finished so far. Depending on my time (and health), I hope to finish it in the next 1-2 weeks. The new start screen, click to enlarge. 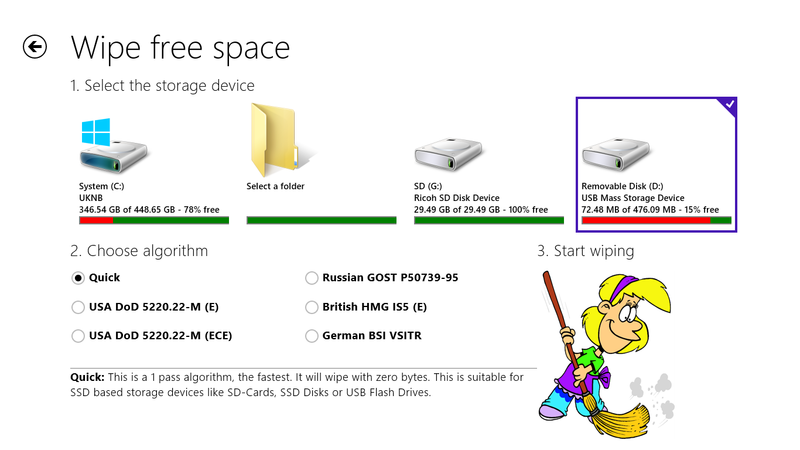 From here, you can choose what you want to do: Clean the free storage space on a device, or shred files and folders. Simply click on the corresponding picture to go to the next screen. The wipe screen, click to enlarge. As you can see, here I introduce a new major feature. The application now presents a list of all removable devices, that are connected to the system, plus the system device and the option to select a folder, as in the previous version. After selecting a folder, the free/used space and folder name is also displayed for that folder in the list. The device information is shown in a scrollable horizontal list. After (or before) you selected a file or folder, you can select the algorithm. A short description of the algorithm is shown, when you select an option. A work in progress: The progress bar, click to enlarge. The progress information is now much more accurate, the final version will also include an estimation of the time left and raw bytes written and left to write. I have tested the wipe process with different computers, storage devices and especially possible error conditions. Apart of being much more responsive in updating the progress and being very stable, it is now very fast! At the moment, the shred function is in the works. But it should be finished a bit faster, because it uses the new central wiping/shredding toolkit I implemented in this version. I hope you will like the new version, stay tuned for the final release!